Crawl space repair, a service provided by Rapid Foundation Repair when you have a musty, damp, or humid basement and are starting to notice structural problems with your foundation. One of the first things that needs to be assessed when crawl space repair is needed is to understand the cause of the problem. When a crawl space is constructed, piers are placed below the support beams to support the home. These piers might be made of concrete or possibly wood. They will rest upon either shallow concrete pads or soil that has been compacted. As time passes, these piers shift in the soil because of fluctuation in soil moisture levels, or freezing and thawing. When these piers begin to sink the floors of the home no longer have a stable foundation. You will begin to see sagging or slanted floors. Obviously, in order to find a long lasting solution to the sinking problem, it would make no sense to simply encapsulate the crawl space or to add more piers that will eventually sink again. For more than a temporary fix, it will be necessary to install a deep foundation support system by using a steel push pier system that drives steel pier pipes down to a load bearing soil that is well below soils that are affected by moisture. This system will use the weight of the structure to drive the pier pipe to a load bearing stratum. It then uses a unique manifold system where the structure is simultaneously lifted and locked into place, providing a solid, secure foundation once again. This crawl space repair option is effective in keeping moisture out of your crawl space for years to come. The experts at Rapid Foundation Repair offer quality work in crawl space encapsulation and crawl space repair in Wyoming and the surrounding area. 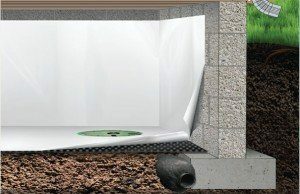 Vapor barriers, a crawl space repair option, or crawlspace encapsulation, where your crawl space is protected with a vapor retardant material to prevent moisture from creeping into your home. Vapor barriers, or crawl space encapsulation, keep moisture from getting to places it doesn’t belong, preventing problems like dry rot or mold. Without a vapor barrier, water vapor can stay in the walls and condense back into a liquid: a situation that can lead to big problems. Rapid Foundation Repair only uses the highest quality materials manufactured by Earth Contact Products (ECP) when they are doing crawl space repair and crawl space encapsulation. Rapid Foundation Repair is your number one crawl space repair in Rapid City and many other South Dakota cities. We’ll help you with any waterproofing or foundation repair you may need. If it’s crawl space repair you need, call us. We’ll help you fix your problems and prevent future issues in your crawl space. One of the most common places for a home in South Dakota to develop a moisture issue is the crawl space. 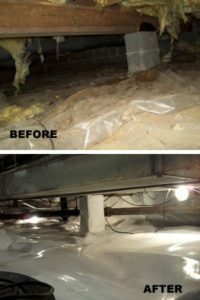 This is often because homeowners do not realize the importance of the crawl space and as a result, they tend to neglect proper crawl space care practices. Because the concrete that surrounds a crawl space is porous, there is always a chance that moisture vapor can find its way into the crawl space. If your crawl space does develop a moisture problem, it could lead to water damage, wet insulation, pooling water, dry rot, and mold. These are all dangerous issues for you and your family and should be addressed immediately. The best way to waterproof your crawl space is to install a vapor barrier or crawl space encapsulation. A vapor barrier. or crawl space encapsulation, is a damp proofing material designed to keep moisture out of the crawl space. These barriers are usually made of some type of foil or plastic sheeting. They act as moisture retarders, preventing the diffusion of water vapor through the walls and floors. The vapor barrier is installed all along the interior of the crawl space to seal out moisture. The installation of a crawl space vapor barrier is a process normally referred to as vapor barrier encapsulation. By hiring the waterproofing experts from Rapid Foundation Repair to install a vapor barrier in your crawl space, you will ensure a dry, healthy environment throughout your entire home. In addition to keeping moisture and mold out of your crawl space, a vapor barrier will also lower the humidity of the air in your home. This means that your energy bills will go down, as your HVAC systems have to work significantly harder to regulate the temperature of humid air that they do to heat and cool drier air. Keep your home functioning efficiently with crawl space encapsulation services from the team at Rapid Foundation Repair. Rapid Foundation Repair will assess your situation, offer the best solution, and provide quality service to solve any problems. Call us today for your free estimate on your crawl space repair for your South Dakota or Wyoming area home.